Action from Glenavon's dramatic 2-1 victory over Crusaders. Pic by Pacemaker. It provided a dream finish to a fine fightback as the Lurgan Blues cut the gap on third-place Crusaders to a single point thanks to a thrilling 2-1 victory. With 88 minutes on the clock Crusaders appeared set for success and a boost in pursuit of second spot. Jordan Owens’ second-half header handed the Crues control but the game turned when player/manager Gary Hamilton stepped off the sidelines. Hamilton’s slipped pass minutes after his introduction was fired home from inside the area by another Glenavon substitute, Stephen Murray. Hamilton then delivered the corner-kick which led to referee Steven Gregg awarding a last-gasp penalty kick - with a composed Clingan decisive from the spot. 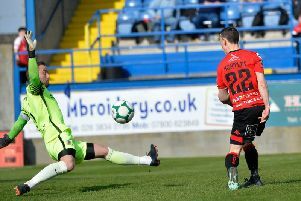 The Lurgan Blues proved slow to settle as Crusaders enjoyed the early momentum and forced Jonny Tuffey into a double save. Owens’ flick released Paul Heatley along the left and the resultant low cross was steered goalwards by Philip Lowry but Tuffey blocked with his legs then reacted to claw away Gary Thompson’s looping follow-up effort. Conor McCloskey then picked out Andy Hall, with the initial shot blocked and the cross pushed out by Gerard Doherty. Doherty had to be alert soon after to tip over the bar a Robert Garrett drive from distance. 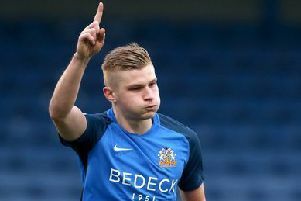 Tuffey was on hand to frustrate Heatley with another smart block but Glenavon carved out the best first-half scoring opportunity in the closing stages. Hall’s corner-kick was met on the run by Rhys Marshall and the header bounced off both the underside of the crossbar and the line. Crusaders’ strong start to the second half featured early sights of goal in quick succession. Heatley skipped into space but Tuffey raced out to block the shot. However, Crusaders broke the deadlock on 47 minutes with a goal simple in execution but no less effective as Rory Hale’s clipped cross found Owens in space from a few yards and the close-range header found the net. Glenavon’s response featured teasing balls into the box by McCloskey and Josh Daniels without any final touch - until the dramatic finale.